Kids can get dull teeth just like adults from the foods they eat, the beverages they drink, and lack of proper dental hygiene. Many young people, particularly teens, want to use whitening strips to get a gleaming smile, but dentists warn that they might not be safe for young people. 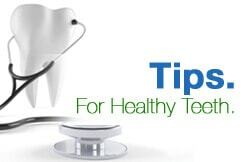 Whitening strips coat teeth with hydrogen peroxide for 15 to 60 seconds. While low concentrations of hydrogen peroxide are generally safe for adults, there has not been much research done looking at their effects on children. Some whitening strips have a hydrogen peroxide concentration as high as 13 percent. Products with a higher concentration are more likely to have an adverse effect on a child. This has led the American Academy of Pediatric Dentistry to decide that it cannot say teeth whitening strips are safe for children. One of the main causes for concern is the potential for user error. The AAPD found that many children who used whitening strips themselves used them incorrectly. Some children leave the strips on much longer than recommended in the hopes of making their teeth whiter. There is also a danger that younger children could swallow whitening strips and get sick. Another major concern is the potential for whitening strips to cause tooth sensitivity. When they are used too long in adults, whitening strips can cause sensitivity. It is unclear whether the effects are more or less serious in baby teeth. The American Academy of Pediatric Dentistry’s official position is that whitening strips are not safe for children under the age of 15 because of the lack of research. However, there are other ways to help your child have white, shiny teeth. Encourage your child to brush twice a day and floss once a day and to avoid foods and beverages, such as soda, that can stain teeth. Another way to help your child have white teeth is to take him or her to the dentist for regular cleanings. If it is time for your child’s routine exam and cleaning, make an appointment at CT Pediatric Dentistry today.